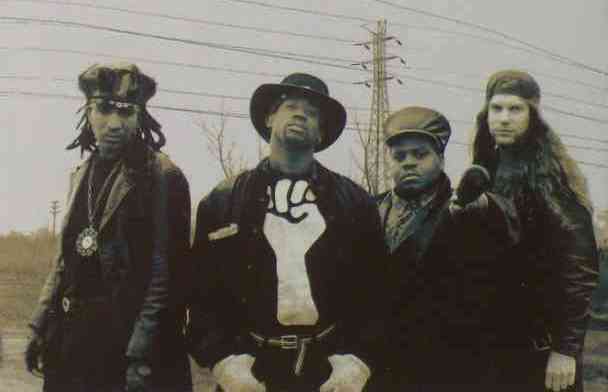 24-7 Spyz are a band from the South Bronx, New York, formed in 1986, originally consisting of Jimi Hazel (guitar), Rick Skatore (bass), Kindu Phibes (drums), and P. Fluid (real name, Peter Forrest) (vocals). The band is best known for mixing soul, funk, reggae, and R&B with heavy metal and punk. The fact that they are African Americans playing variations of heavy metal led critics to compare them to bands such as Living Colour and Bad Brains. Though they were pioneers in the fusion of these particular music styles, influencing many bands, they have never achieved substantial commercial success. After several lineup changes, the band broke up in 1998, but reformed in 2003 before releasing their first new album of original material in over a decade in 2006.